I have long recommend a first checkup by 12 months old to make certain that teeth and jaw development are normal, and even more importantly so that parents and guardians know how to help their children be healthy from the start. The American Academy of Pediatric Dentistry now also recommends the same thing: First Visit by the First Birthday. Being a ‘good parent’ does not require that you take your child to a Children’s Dentist (pedodontist). 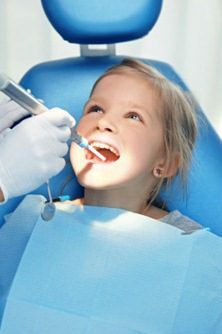 I routinely see children, and I do refer to a pedodontist when needed (extensive dental treatment required, special needs, etc.). * Generally it is most effective if parents are NOT in the room during the full time of treatment. If the parents have any dental anxieties, please don’t bring those with you. For your child’s best interest, you will likely be invited to wait in the reception room during treatment. Education and prevention are the cornerstones of my concern for the dental health of children. In addition to teaching parents and guardians about dental care for their child, checkups are an appropriate time to comfortably and easily evaluate: how many teeth, are all teeth present, loose teeth, cavity check, check health of gums, braces / bite evaluation, habit evaluation, homecare / prevention, fluoride use, review diet, review health history, evaluate tongue, speech, address adult’s concerns, and teach adults how to care for child’s teeth. 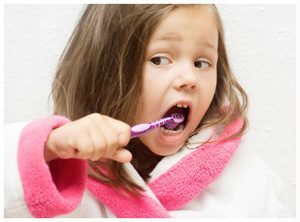 It is often difficult initially to brush your child’s teeth – that’s normal. They can really put up a struggle, screaming, kicking, crying, running away, not opening their mouths – every kid is different.